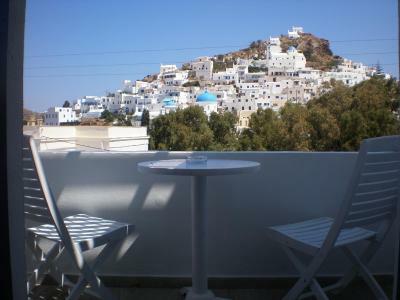 Lock in a great price for Armonia Pension – rated 9.4 by recent guests! The owner was amazing!! The best service we have ever had. So friendly and accomodating. Helped us find extra accomodation in Ios as his hotel was completely booked. 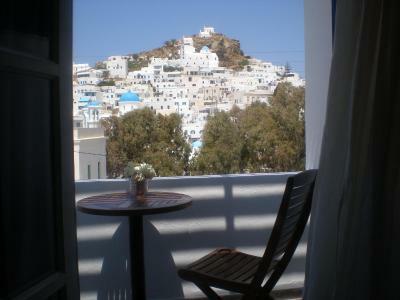 Perfect location, a few minutes from chora. Extremely clean. 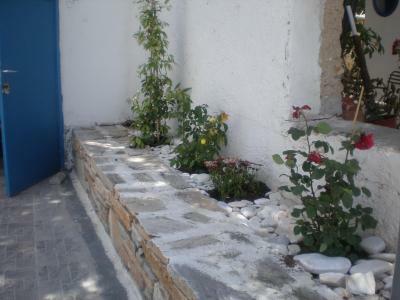 Close to everything (buses, bakery, supermarket, coffee shops, restaurants). Very helpful staff. Great value for money. The owners are such a kind beautiful family, happy to help with everything you need. Also offered free transfers to the port which was much appreciated as a student traVeller. 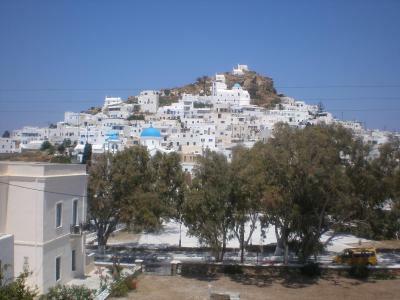 Hotel is located in the opposite of the Chora and you have a great view to the Chora. Yiannis, the host picked us up at the port and dropped us off the port, when we were leaving the Island. He gave us assistance and advices in every way. 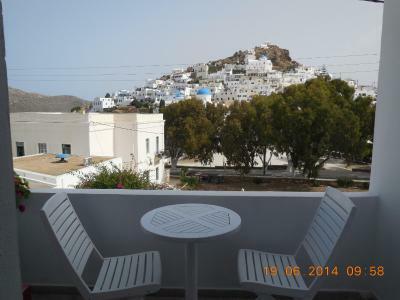 In the very near of the hotel you can find the bus-stop (to the port and to the beach of Mylopotas), a super-market and you have a very short way to the Chora with a lot of bars and Restaurants. For Ios it was a quiet place to stay. Wonderful stay. The guys from the hotel came to pick us up at the port, and was very helpfull. Everything is super close. Worth every penny. Recommend it highly. The room was extremely clean and decorated in tasteful 'contemporary Cycladic' style , the air conditioning worked perfectly, the assortment of toiletries was more than adequate (classy, even), the room had a small balcony--great value all round. The proprietor, Giannis: what a guy--generous in word and deed. Talked openly and interestingly and picked us up from the port and dropped us back at our convenience, in spite of the fact we were only there for one night. I mean, what more could you ask? Giannis was an ecellent host. He picked me up at the port and gave me some good tips how to get to various places; The appartment was very clean and modern. Especially the bathroom was amazing (ok, a shower curtain would be better); Highly recommended! Wir durften das Zimmer am Abreisetag noch bis zum Abend ohne Mehrkosten nutzen. 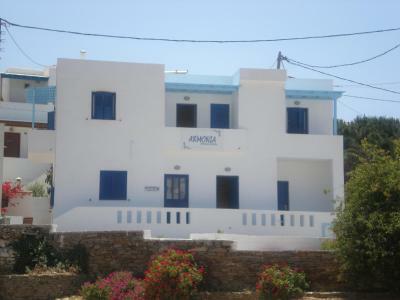 Just a 10 minute walk from Mylopotas Beach and a short walk from the center of Ios, Armonia Pension offers free round-trip transportation from the port. 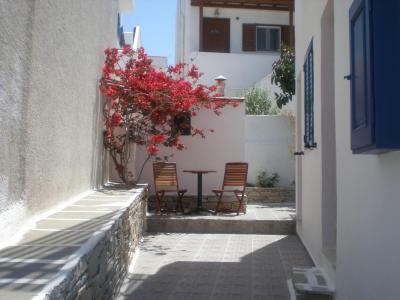 It features air-conditioned rooms with free Wi-Fi and balcony overlooking the whitewashed Ios Town. 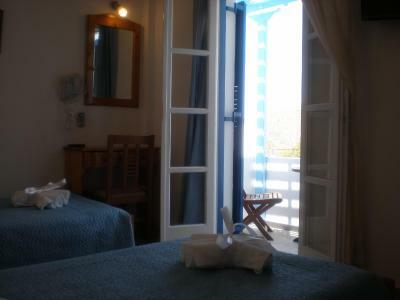 An LCD TV, a safe and a hairdryer are included in all rooms at the Armonia Pension. 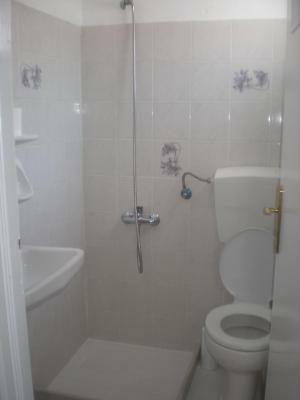 Each has a private bathroom with shower and toiletries. 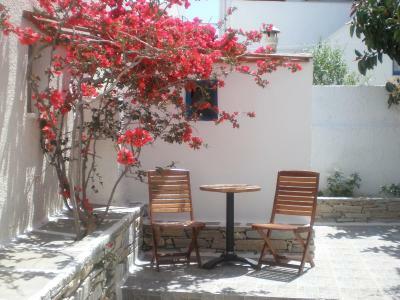 Traditional taverns serving ouzo, clubs and cafés are within a 5 minute walk of the property. 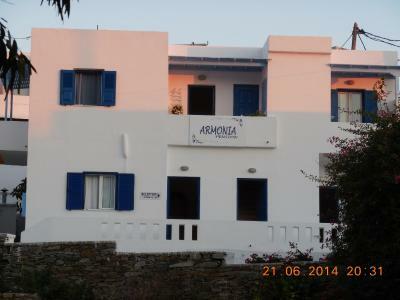 The staff at the 24-hour front desk can offer information on beaches such as Magganari and Kalamos. A bus stops right next to the property. 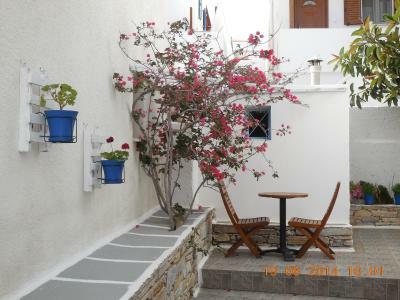 뀐 Located in the top-rated area in Ios Chora, this property has an excellent location score of 9.7! 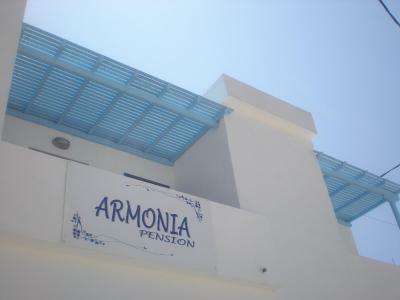 When would you like to stay at Armonia Pension? 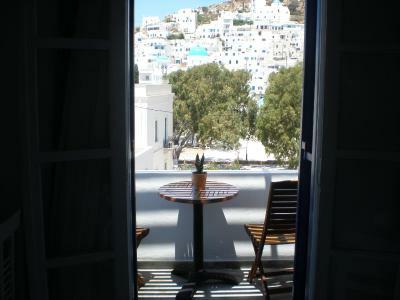 Just a short walk from the center, this air-conditioned room offers free Wi-Fi and balcony overlooking Ios Town. An LCD TV, a safe and a hairdryer are included. 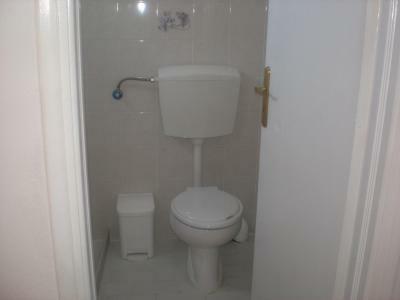 Includes private bathroom with toiletries. 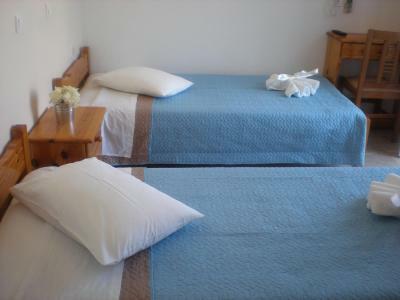 Please note that twin rooms can accommodate an extra bed. 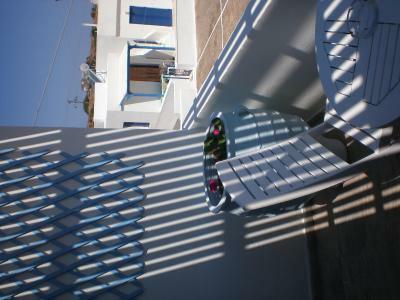 House Rules Armonia Pension takes special requests – add in the next step! 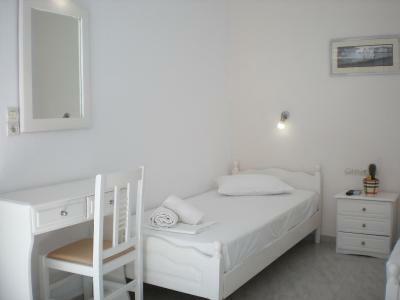 One child from 2 to 12 years is charged EUR 7 per person per night in an extra bed. Armonia Pension accepts these cards and reserves the right to temporarily hold an amount prior to arrival. When the cleaner burst into my room before giving me a chance to say I was not decent.. although she did apologise after she continuted to push the door open. The only thing that could be improved would be an shower curtain. But even without it's not really a reason to lament. The shower was nicely constructed and had two walls, but a shower curtain would be an improvement. This was not a big deal, though, because the drainage in the bathroom worked well.